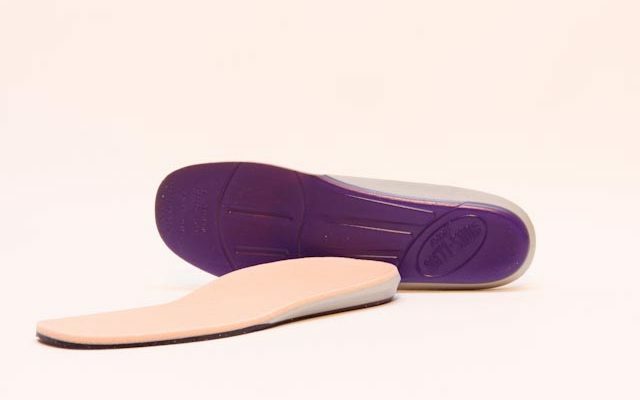 Shoe Style – Your pedorthist has carefully designed your orthotics for your most important footwear so it may not fit into all of your footwear. 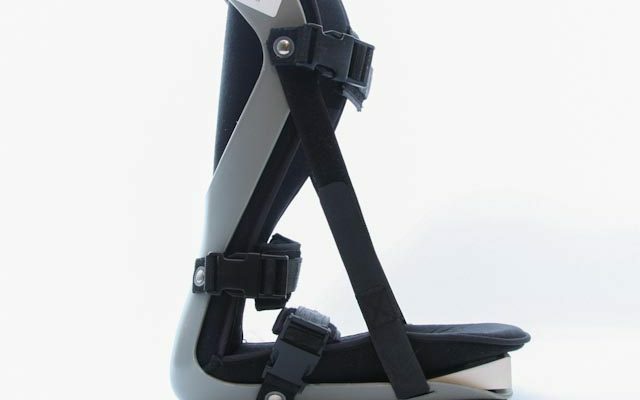 For example, an orthotic designed for running shoes will not fit into dress shoes. If you require support in your dress shoes, our staff would be happy to discuss other options with you. 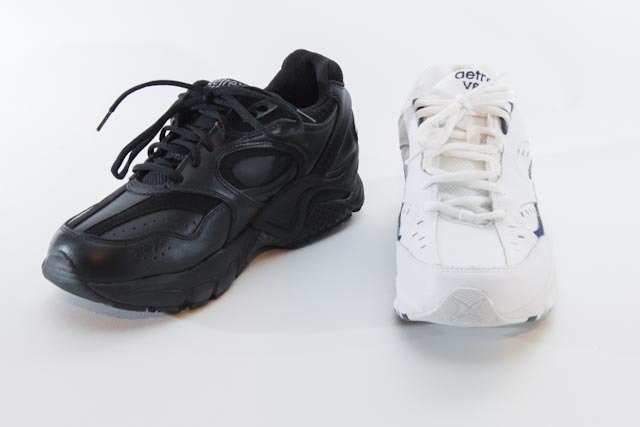 Custom-made vs. over-the-counter (OTC) footwear (comfort, orthopaedic or therapeutic) We carry a limited line of O-T-C footwear specializing more in orthopaedic and therapeutic lines. 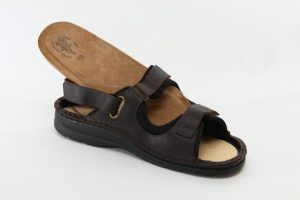 We can cast for custom-made footwear as well and have them sent to a Certified Master Craftsman. The delivery time is much longer on these. We supply a less expensive lower end shoe to a more expensive higher-end shoe. 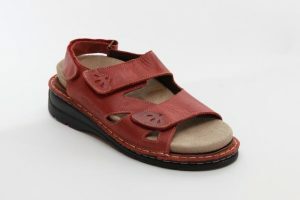 Custom-made footwear is generally made for people with foot problems that cannot be remedied by O-T-C footwear. In regards to insurance coverage, you should check with your representative on your requirements for eligibility. Shoe Features – For most people, desirable shoe features include a strong heel counter (the cup your heel fits into), torsional stability (the shoe is difficult to twist with your hands) and a correct flex point (the shoe flexes where your foot flexes). 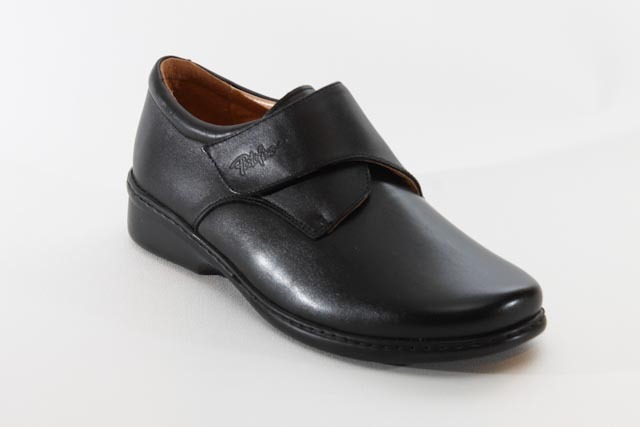 Footwear Fit – Our staff are Kinesiologists and have extensive training in footwear fitting. We will be happy to answer your questions and help with your shoe fitting needs. Occasionally, you may need a footwear modification, including rocker soles, flares, or lifts. Your pedorthist will discuss these options with you. Many running and walking shoes have the features listed for therapeutic footwear. Common examples of orthopaedic shoes can be found in the footwear provided by manufacturers such as P.W. Minor and Drew. Children don’t need shoes until they begin walking, usually at around 12 to 15 months of age. Until then, socks or booties are enough to protect a crawling infant’s feet and keep them warm. When your child does begin standing and walking, however, shoes provide an excellent form of protection from injury. After your child begins wearing shoes, there is nothing wrong with letting him or her go barefoot indoors. A good time to buy your child’s first pair of shoes is when he or she starts standing and walking. Shoe stores that specialize in children’s shoes are likely to offer the widest range of sizes and styles, and will usually take more time to make sure a pair of shoes fits properly. A soft, pliable shoe with plenty of room, such as a sneaker, is the ideal shoe for children of all ages. The toe box should provide enough space for growth, and should be wide enough to allow the toes to wiggle. A finger’s breadth of extra length will usually allow for about three to six months’ worth of growth, though this can vary depending on your child’s age and rate of growth. If your child frequently removes his or her shoes, those shoes may be uncomfortable. Check your child’s feet periodically for signs of too-tight shoes, such as redness, callousing or blisters. And have your child’s feet measured periodically at the shoe store to determine whether his or her feet have grown enough to warrant a larger pair of shoes. Remember that the primary purpose of shoes is to prevent injury. 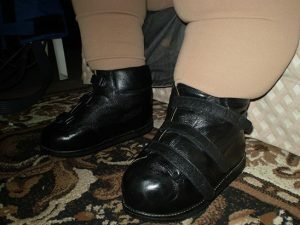 Shoes seldom correct children’s foot deformities or change a foot’s growth pattern. Casting, bracing or surgery are often needed if a serious deformity is present. If you notice a problem, have your child examined by an orthopaedic surgeon. Because high-top shoes tie above the ankle, they are recommended for younger children who may have trouble keeping their shoes on. 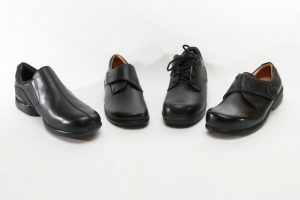 Contrary to common belief, however, high-top shoes generally offer no advantages in terms of foot or ankle support over their low-cut counterparts. Most men’s shoes conform to the shape of the feet and have a roomy toe box with sufficient horizontal and vertical space and a low heel (usually about half an inch high). 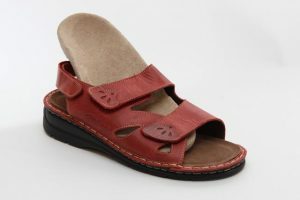 Soles made of hard materials such as leather or soft materials such as crepe can both be worn, but softer soles tend to be more comfortable. If you stand for extended periods of time, shoes with soft, pliable soles will protect your feet and help keep them comfortable. 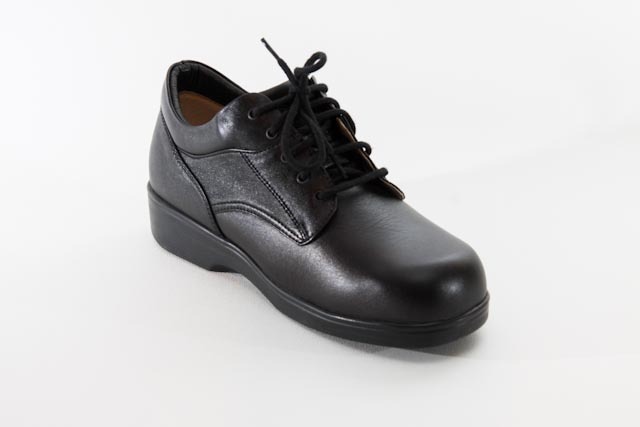 Work shoes are also available with varying characteristics, depending on the wearer’s occupation. Boots made of thick leather with steel toe boxes can be worn to protect the feet from injury. Boots with varying degrees of traction also are available. Low-heeled shoes (one inch or lower) with a wide toe box are the ideal choice for women. An ample toe box that can accommodate the front part of the foot is as important as the heel in determining fit. Even low-heeled shoes can cause problems if they don’t fit well. Years of wearing too-small shoes can lead to permanent deformities. It can be hard to choose from the many different types of athletic shoes available. The differences in design and variations in material, weight, lacing characteristics and other factors among athletic shoes are meant to protect the areas of the feet that encounter the most stress in a particular athletic activity. The purpose of athletic shoes is also to give the player more traction. 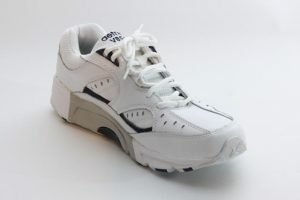 A jogging shoe will be designed differently from an aerobics shoe, for example. The key ingredient in a well-fitted athletic shoe is comfort. A good fit will reduce blisters and other skin irritations. If you participate in a sport three or more times a week, you need a sports specific shoe. Athletic shoes can be grouped into several categories: Racing, training, and walking. Included are shoes for hiking, jogging, and exercise walking. 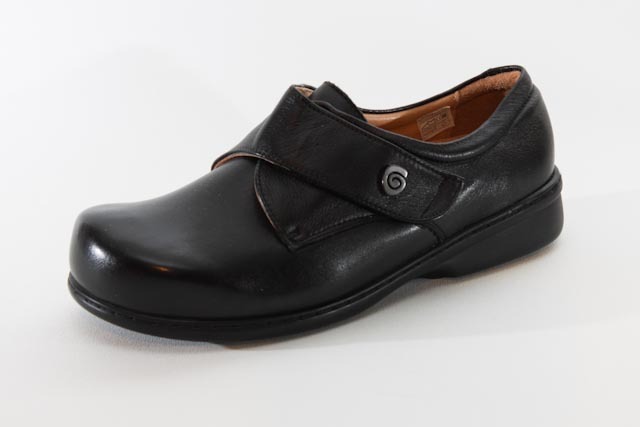 Look for a good walking shoe that has a comfortable, soft upper, good shock absorption, smooth tread, and a rocker sole design that encourages the natural roll of the foot during the walking motion. The features of a good jogging shoe include cushioning, flexibility, control and stability in the heel counter area, lightness, and good traction. Court sports. Includes shoes for tennis, basketball, and volleyball. Most court sports require the body to move forward, backward, and side-to-side. As a result, most athletic shoes used for court sports are subjected to heavy abuse. The key to finding a good court shoe is its sole. They are typically flat with low heels and give a little more side to side than running shoes to reduce ankle sprains and stress on our knees. Ask a coach or shoes salesman to help you select the best type of sole for the sport you plan on participating in. Field sports. Includes shoes for soccer, football, and baseball. These shoes are cleated, studded, or spiked to create better grip. The spike and stud formations vary from sport to sport, but generally are replaceable or detachable cleats, spikes, or studs affixed into nylon soles. Winter sports. Includes footwear for figure skating, ice hockey, alpine skiing, and cross-country skiing. The key to a good winter sports shoe is its ability to provide ample ankle support. Track and field sport shoes. Because of the specific needs of individual runners, athletic shoe companies produce many models for various foot types, gait patterns, and training styles. It is always best to ask your coach about the type of shoe that should be selected for the event you are participating in. Specialty sports. Includes shoes for golf, aerobic dancing, climbing and bicycling. Outdoor sports. Includes shoes used for recreational activities such as hunting, fishing, hiking and boating. Please be careful when buying your shoes that you get the correct length as well as width. You should have a few millimeters space in both the heel and toe areas to allow for flexing in the shoe when walking. (see center diagram above) Your toes should not touch the wall at the front nor should your heel touch the back. Quite apart from comfort this will improve the longevity of your shoes. Walking in shoes and sandals with a heel causes an unnatural shift in your weight distribution as you walk. Most of the weight now rests on the bones in the front of your shoe causing undue stress to the foot bones, the calf muscle and the spinal column. Switching over to “zero heel” footwear relieves this stress and helps to align the spine and balance your body weight more evenly as you walk. Fashion shoes are made to achieve a certain look which most of the time disregards the shape of the foot. The result is footwear that crowds your foot and pinches the toes. 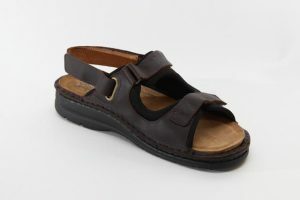 Painful bunions and hammertoes can result from the long time wearing of such footwear.